Give thanks in all circumstances; for this is God's will for you in Christ Jesus (1 Thessalonians 5:18). Many of the able-bodied men were too infirm to work, and some died of their illnesses. Thus, only seven residences (of a planned nineteen) and four common houses were constructed during the first winter. During the first winter in the New World, the Mayflower colonists suffered greatly from diseases like scurvy, lack of shelter and general conditions onboard ship. 45 of the 102 emigrants died the first winter and were buried on Cole's Hill. Additional deaths during the first year meant that only 53 people were alive in November 1621 to celebrate the harvest feast which modern Americans know as "The First Thanksgiving." Of the 18 adult women, 13 died the first winter while another died in May. Only four adult women were left alive for the Thanksgiving [Source: Wikipedia]. Almost half of this settlement of Pilgrims passed away, and yet the half of the colony who survived the loss of their family members and friends still took the time to celebrate God's helping them through a harsh winter and then His hand of blessing on a bountiful harvest in the following fall season. 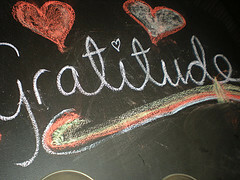 The real test of thankfulness comes when times are difficult, not when everything is running smoothly. It's way too easy to thank God during the good times. It takes a deeper, stronger character to thank Him for the times of a difficult journey. Consider it pure joy, my brothers and sisters, whenever you face trials of many kinds, (James 1:2). Peace and calm (not anxious). Pray it through! Petition God for assistance. Over the last few weeks, I have shared with you the trials and pain of my own journey in the last two years. While I readily admit that during the majority of these two years, my life has not always exhibited the peace, thankfulness, and joy that we are called to display. I have prayed and petitioned God to work in and through the entire mess, but for whatever reason, He has had different answers to my requests than my own solutions to these problems. I have first-hand experience that "His ways are higher than my ways. His thoughts are higher than my thoughts" (Isaiah 55:8-9). Over time, though, the Lord has granted me the peace, thanksgiving, and joy as I have relied Him. Through the trials, I have attempted to be thankful for everything else that has been going right in my life as well as the bad. Even though it can be difficult, the amazing thing I have discovered is that it really does work. Embrace an attitude of thanksgiving even during difficult times and see what God can and will do as a result.